Availability of IIT GATE 2015 Admit Card on the Online Application Interface for printing from 17th December 2014. 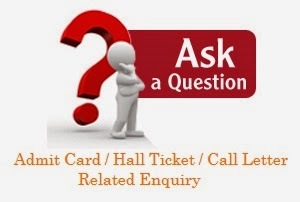 Candidates need have their Hall ticket 2015 for examination.Admit card uploaded in 17th December 2014. Admit card must for Board exams without admit card candidates’ permit to sit in examination hall. If you have not followed examination rules you have dismissed from examination .so carefully follow rules. Several public sector undertakings (PSUs) have, in the past, used GATE scores for screening for providing a salaried employment. A select few such organizations are: Bhabha Atomic Research Centre, Bharat Heavy Electricals Limited, Indian Oil Corporation Limited, National Thermal Power Corporation, Power Grid India, etc. It is expected that such PSUs would use GATE Scores this year as well. Note: GATE administration is not responsible for employment opportunities. Candidates qualified must check newspapers and other reliable sources for any such information. The overall co-ordination and responsibility of conducting GATE 2015 lies with Indian Institute of Technology Kanpur, which is designated as the Organizing Institute (OI) for GATE 2015.